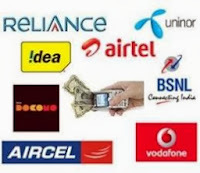 Today I am going to share simple tricks to transfer mobile phone balance to your friend’s mobile number in major mobile networks of India like Airtel, Aircel, Idea, Uninor, Vodafone, Reliance GSM, BSNL and Tata DoCoMo. Sometimes your friend is in an urgent need of mobile phone balance. In this situation, you can send mobile balance to your friend by using this trick which is 100% working. Also you can repay for dues to your friend by transferring balance from your own mobile phone number to your friends mobile number. Note: This post is only for educational/informational purposes please don’t misuse this option by asking Talk Time to Unknown Numbers/Persons. Now Follow the below Steps of any Network from which you want to Transfer the Balance to your friend, family members etc. To Transfer Balance in Airtel type *141# and press the call/green button from your hand set. Now wait for few seconds to receive the main menu and follow the on screen instructions to transfer balance to other airtel mobile number(s). You can also Gift Packs to other airtel users from the main balance of your account. Just Dial *122*666# from your Aircel mobile and Follow the on screen Steps. Just write as *122*666*Amount*Mobile Number*1# e.g. Dial *122*666*4*9858302394*1# to directly transfer Rs 50 to Aircel Mobile Number 9858302394. To change the Transfer Amount in Rupees replace 2 with your option. Just write an SMS as GIVE Mobile Number AMOUNT and send it to 55567. For example, if you want to send Rs 50 to Idea Mobile Number 8999944444. Type SMS as GIVE 8999944444 50 and send it to 55567. Just write as *202*Mobile Number*Amount#, e.g. Dial *202*8999912345*50# to directly transfer Rs 50 to Uninor Mobile Number 8999912345. Write *131*AMOUNT*Mobile Number#, e.g. *131*50*8999991234# to transfer Rs 50 to Vodafone Mobile Number 8999994444. Step 4: Enter the pin to proceed. Default PIN is 1. E.g. send GIFT 9419012345 50 to transfer Rs 50 to BSNL Mobile Number 9419012345. Just type an SMS as BT MOBILE NUMBER AMOUNT and send it to 54321, e.g. Type BT 8999994444 50 to transfer Rs 50 to Tata DoCoMo Mobile Number 8999994444 and send to 54321. Note: You cannot transfer your balance from one network to another.